Our classic Rockfall series gets a reboot. Written from the ground up with a whole new engine, Rockfall DX now features higher resolution graphics and will also take advantage of the extra real estate provided by widescreen monitors. But the best news is that Rockfall DX is also available for OS X as well, so all those Mac users will be able to experience Spud's antics for the first time. 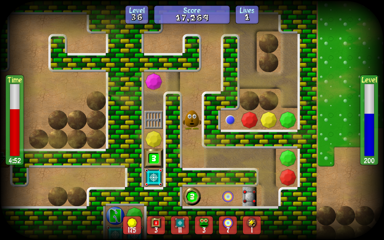 For the uninitiated, Rockfall DX is a classic arcade puzzler, which sees you guiding a little fellow called Spud around underground mazes collecting any riches that can be found. Things are never simple though, as he will also have to contend with falling boulders and various other creatures. Rockfall DX is available now for PC and Mac.